London based record producer/songwriter & music video Director Spacey Blak straddles documentary and fiction with Something Hit Me – a portrait piece created for Mathieu Ajan to augment his recent photography exhibition, which delves into the life and motivations of the diminutive artist. 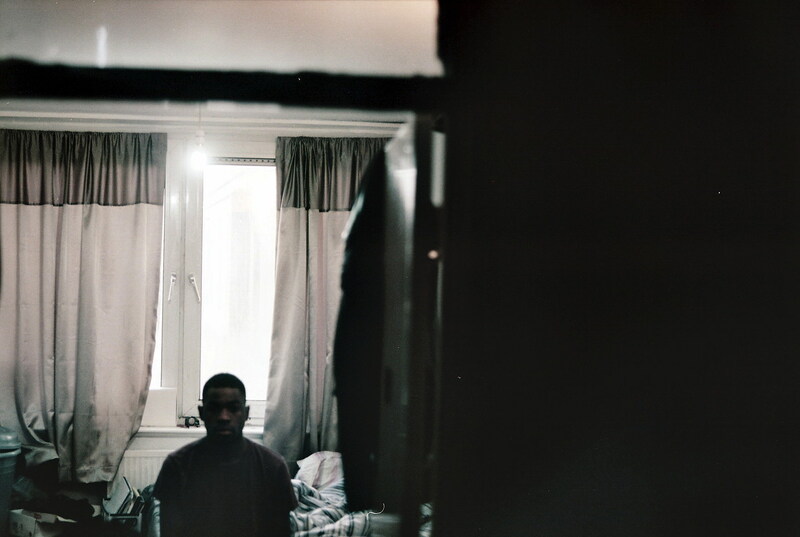 Blak takes DN through the down to the wire production of his debut short film. This is my first short film and it came about when Mathieu Ajan asked me to provide a visual piece that reflected him for his photography exhibition. Mathieu gave me a reference video for what he had in mind but I felt it was a little generic and wouldn’t give the audience anything new or allow them to discover him further. So I explained to him the idea of doing an experimental short film that was a combination of fiction and non-fiction and he responded simply by saying “Do your thing, I trust you”. Mathieu gave me complete creative control which in actuality helped me a lot because in truth I initially didn’t know what story I was going to tell. Me and Mathieu met up again and I got him to discuss his life and growing up in detail. It was during this meeting I sort of discovered what story I was going to tell. I recognised Mathieu’s history of anger because it resonated with me and knew I wanted to tell a story of a lost individual who found his way out of darkness through photography. This was 3 weeks to the deadline of December 1st 2014, the day of the exhibition. The following week I made a short trip to LA (the timing couldn’t have been any more perfect lol). I was back in London a week later with barely a few words in a word document but a somewhat developed idea in my head. It was now the 25th of November, 6 days till judgement day and we got shooting. It was around 2am in the morning armed with nothing but a Canon 7D, we shot what was the opening scene (the first scene in the video was the first clip we shot, if I remember correctly). Mathieu is not an actor but his energy was perfect. During that week, over about 4 days, we spent a few hours getting the footage we needed. It took me about 6 hours to edit the video in Adobe Premier Pro CC. 4am on the 1st of December and we recorded the voiceover at Mathieu’s photography studio with a Zoom H4n. Choosing to record in this room was a creative decision I made because I felt it brought another level of realism and uniqueness to the film. 6pm at the event and I was hidden away at the exhibition venue completing the edit. The whole production was a one man crew and shot using a Canon 7D with the ML Raw software at a 2.35 ratio with a Canon 50mm 1.4 and Canon L series 24-105mm. The only audio I recorded was voice over and the rest of the sounds were sound recordings/effects I found on freesound.org. I graded the video in Adobe SpeedGrade CC using Vision colour LUT as a base to begin. This was not my first visual piece as I have directed music videos in the past but it was my first short film and was shot pretty much guerilla.